As most of you know, this year marks the centenary of World War I. Although the war did not officially begin until the end of July 1914, its precipitating event — the assassination of Archduke Franz Ferdinand of Austria in Sarajevo — took place on June 28, 1914. To mark the centenary, this June, and for the rest of the summer, I’ll be writing from time to time about the literature of the Great War, since it’s a special interest of mine. This month, weekly poetry posts will feature poetry of the First World War, and so you’ll notice that the Poetry Concierge will take a brief hiatus, appearing sometimes on Fridays before picking back up in July. Today I’d like to point out two of the war’s most famous poems, Rupert Brooke’s “The Solider” and Wilfred Owen’s “Dulce et Decorum Est.” I am neither the first nor the last to place the two poems side-by-side, but it’s an instructive experience, I think. Both Brooke and Owen were British soldiers, and both were writing poetry before the war began. Both died during the war. Brooke died in 1915 of an infection following a mosquito bite, before experiencing the horrors of trench warfare. Owen, on the other hand, experienced the full terrors of life and death in the trenches. He was killed on November 4, 1918, and his mother learned of death on Armistice Day, just one week later. The juxtaposition of the verse’s formal components with its brutal content is just one part of Owen’s brilliance. The poem describes a gas attack; the speaker is haunted by the vision of the man who couldn’t get his mask on in time. Initially, the speaker is distanced from the dying man thanks to his own gas mask: “Dim through the misty panes and thick green light, / As under a green sea, I saw him drowning.” Then, an incredibly well-placed stanza break, and a switch from the past to to the present tense to bring the sense of immediacy, already created by the detailed language, home: “In all my dreams before my helpless sight, / He plunges at me, guttering, choking, drowning.” Drowning without water. This makes me think about how important it is, and even how lucky we are, to have poems/stories/etc. that were written about these things that are so hard for most of us to imagine. By the people who lived them. What a great feature for the month! I’ve always found these poets and their work to be an intense, inspiring read. Looking forward to seeing which other poets/poems you profile. Your review reminded me to revisit these poems for a more thorough read. Both are amazing poems I studied long ago. I look forward to seeing what other poems you recommend from the Great War. Thanks, Ngan! There’s so much to choose from . . . Thank you! I am also fascinated by the Great War and I look forward to more of your posts. Thanks Abby! Loving your blog, by the way! Fantastic post. Owen’s poem has always stuck with me, particularly those final lines. I’m really looking forward to more of these posts. I love learning about this period. Have you ever read the Regeneration trilogy by Pat Barker? 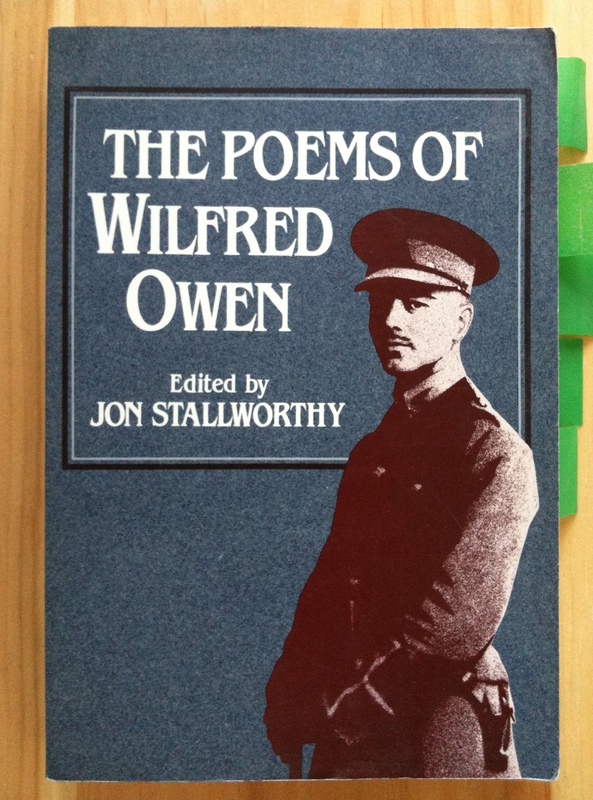 The first book centers largely on Siegfried Sassoon, if I’m remembering correctly, and I think Wilfred Owen makes an appearance. It’s really good, if you haven’t gotten to it! Thanks, Juliana! Actually, I wrote part of my undergrad thesis on Pat Barker’s trilogy — I love those books. Her two most recent books are about the war too — I reviewed them last year, I think. Thank you for focusing on this historical period and the writers who experienced and wrote about it. I’ve always been interested in this war, but it has been over shadowed by World War II for which far more has been written and dramatized in movies and TV. As usual, Carolyn, you have great insight into these writers. Thanks, Karen! You’re absolutely right that it’s been overshadowed, especially in movies/TV — I mean, everyone has a favorite WWII movie, right? But I can count the number of WWI movies on one hand. Not that one is more important than the other — just different coverage. Thank you for bringing attention to this!